02:55:00 Makes 10 servings, one wedge (87 g) each. Makes 10 servings, one wedge (87 g) each. 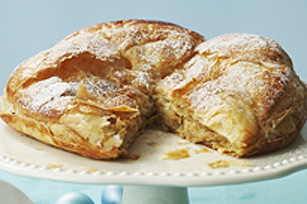 The easy-to-make cream cheese filling replaces the traditional frangipane, or almond custard, used to prepare the traditional recipe. Preheat oven to 400ºF. Place hazelnuts in food processor; cover. Process, using pulsing action, until hazelnuts are finely ground. Add whipped topping, cream cheese, almonds, icing sugar and citrus peel; cover. Process until well blended. Transfer to bowl; cover. Refrigerate 1 hour. Meanwhile, roll out each block of puff pastry on floured surface to 14-inch square. Cut a 30-cm (12-inch) circle in each square; place on baking sheets. Discard trimmings. Cover pastry circles with plastic wrap. Refrigerate until ready to use. Spoon hazelnut mixture onto centre of 1 of the pastry circles, carefully spread to 1 inch of edge. Brush rim of pastry with egg. Cover with remaining pastry circle. Press edges together to seal. Use a sharp knife or pizza cutter to neatly trim edge of dough. Cut hole in top of dough to allow steam to escape. Brush dough with remaining egg. Bake 35 min. or until golden brown. Cool completely before cutting into wedges to serve. Candied citrus peel can be found in the baking section of most grocery stores. If you cannot find it, use the grated peel of 1 orange instead. This cake is traditionally served at the feast of Epiphany, the first Sunday after New Year's Day. The occasion marks the Three Kings' visit to baby Jesus. Some people hide a bean in the filling and the person who receives the wedge with the bean is then considered king for the day. Sprinkle with 1 Tbsp. raw sugar before baking. Savour a serving of this dessert on special occasions. Serving Size Makes 10 servings, one wedge (87 g) each.